Take a break from the intergalactic war to stay hydrated! This high performance tumbler features a double-walled design with vacuum insulation technology to provide a superior experience with your favorite beverages. You'll enjoy hot beverages that stay hot over 4 hours, and cold beverages that can stay cold for up to 48 hours! The Star Wars Dark Side 30 oz. 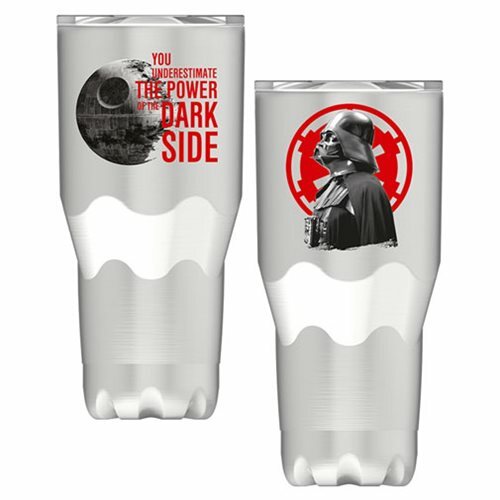 Stainless Steel Vacuum Tumbler includes an image of Darth Vader in front of the Empire symbol and measures approximately 4-inches wide x 8 1/2-inches tall. The Tritan lid slides securely closed to reduces spills and can be used with a straw, while the double all design prevents condensation. The ergonomic design fits in your hand comfortably as well as most standard cup-holders. BPA-free. Hand wash only. Do not microwave.